Horace Peter Bailey was born in Derby on 3rd July 1881 to Peter Bailey, an iron and brass moulder / iron foundry foreman, and his wife Sarah. In the 1870s Warwick Races was rocked by a betting storm, where threats of prosecution abounded. Our family was a boxing family of Watford. We were four brothers, known as the Buxton brothers. Tom Wills, educated at Rugby School, Warwickshire, was an Australian sporting genius. Two of our work experience placement students both chose the football boots on display in Gallery One as their favourite object. Here are two very different perspectives on the same item. Sport is undoubtedly an integral part of contemporary British cultural life, yet there is an uneasy relationship between sports and heritage institutions, which sometimes seem to be from completely different worlds. 14 January 2016, marked 140 years since Essex County Cricket Club was established at a public meeting at the Shire Hall in Chelmsford. At the end of a talk, the question was raised as to the precise location of the villa which gave its name first to a district in Aston, and then to the Wesleyan Chapel whose members formed the football club. It was suggested that there was a map in existence which gave this information. In the later years of the First World War and in the years following, women’s teams became more and more common. One hundred and ten years ago, two doctors confronted one another in South London. For those not familiar to stoolball, it’s probably best described as ‘cricket in the air’ with different bats, balls and wickets. The cricket bat, recently acquired by The Friends of Wakefield Art Galleries and Museums for Wakefield Museum, was signed by all the players in the 1935 England-v-South-Africa test match. Published in 1587, De Arte Natandi (“The Art of Swimming”) is the first swimming treatise published by someone from these islands. Burroughs' Wellcome & Co employees were competing in a variety of activities: sprints over a 100 yards, distance running over one mile, a high jump competition and the exertions of the tug of war. The Aviva Women’s Cycling Tour visited Warwickshire for the first time recently, so we thought we’d have a dig around for some Warwickshire cycling history. Earl was famous for his paintings of sporting events and animals, particularly dogs. He exhibited at the Royal Academy from 1857, and one year exhibited a massive 19 works. 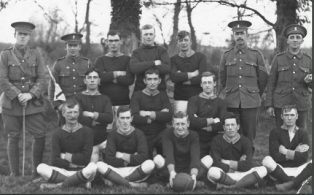 This postcard shows the No 16 Platoon football team, which has some strong Anglesey connections.